Posh made an inquiry about Lee Tomlin's availability in the summer. Peterborough United could sign up to four new players during the January transfer window. Posh chairman Darragh MacAnthony made the suggestion during an impromptu question and answer session with fans this evening (December 4). Striker Ricky Miller has a month to make his mark at Posh. 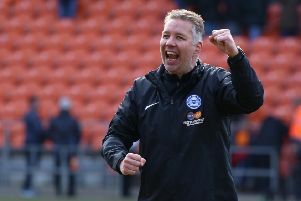 MacAnthony was available on ‘persicope’ for 45 minutes and covered a wide range of topics including possible comings and goings next month, manager Grant McCann’s performance, and his own continued attempt to buy the London Road ground back from Peterborough City Council. MacAnthony also delivered some interesting revelations including an apparent attempt by Lee Tomlin to return to Posh last summer. Wigan showed an interest in Marcus Maddison in the summer. On the January transfer window: “We are in the market for a right wing-back or right-back because no-one has yet made that position their own this season. We would also love a goal-scoring central midfielder. We haven’t scored a single goal from central midfield this season. “We also need support up front for Jack Marriott and Junior Morias. We’ve been frustrated by Ricky Miller. The six-week ban at the start of the season didn’t help him as he was behind fitness wise, but he then let his team-mates and manager down with his off-field issues. He is still our player though and he has a month to make his mark. “We have had four League Two clubs make an inquiry about Ricky. He won’t be going anywhere on loan. If he leaves he would be sold. On Grant McCann: “Grant was aware of the club’s aims at the start of the season. We want success, trophies and a brand of entertaining football. He knows this and there is no point in me reminding him every week. I believe we will finish in the top six and when we find some consistency we will be unbeatable. “We have to gon a run of several wins in a row like we have in previous promotion seasons. We have the ability to manage that. “I would ask the fans to get behind the players and staff now. Let’s not treat every draw like it’s the end of the world and the manager should therefore be sacked. MacAnthony also confirmed former Posh striker Souleymane Coulibaly is training with the club, but a contract dispute with his current club stops him signing for anyone else. Posh are aware of the form and ability of Grantham striker Lee Shaw. McAnthony remains committed to buying the ground back from PCC. he has big plans for when/if it happens.